The accounting literature has long examined how public disclosures relate to firm competitiveness. If common ownership is in fact hurting competition, companies with owners in common should be less reticent in their public disclosures. A new paper by Pawliczek and Skinner finds that this is indeed the case. Economists’ models of competition traditionally assume that competing firms have different owners. When this is true, firms compete intensely to maximize the firm profits, which are in turn passed on to the owners. But when this assumption is violated—when at least some of the owners of competing firms are common—the nature of competition is likely to change. If managers take the preferences of these shareholders into account, firms may be less inclined to steal market share from other firms. In the extreme case, if all owners held proportional shares of all firms in an industry, those firms should behave like a single monopolistic firm. This phenomenon of common ownership is on the upswing in the United States, as many large institutional shareholders have stakes in firms that compete in the same product markets. By one measure of common ownership, the modified Herfindahl Index, common ownership has been increasing at a rapid rate over the last 15 years relative to increases in institutional ownership or industry concentration ignoring common ownership. Figure 1. 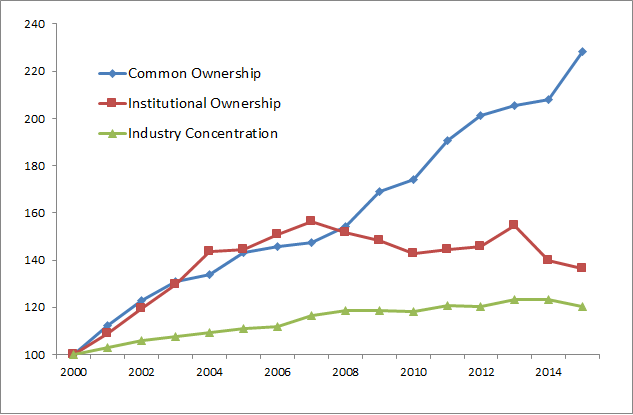 Changes in Common Ownership, Institutional Ownership, and Industry Concentration (indexed based on the value in 2000). Notes: Institutional Ownership is the percentage of shares owned by institutional shareholders on average. Industry Concentration is the Herfindahl index which is calculated as the sum-squared of firms market shares within an industry. It increases as an industry becomes more concentrated. Common Ownership is measured as the change in the Herfindahl index resulting from including the effects of common ownership. It increases as more firms in an industry have institutional owners in common. Prior work has found that higher levels of common ownership are associated with less competitive outcomes in specific industries including higher fares in the airline industry and higher fees in the banking industry. Beyond affecting price levels, changes in the nature of competition due to common ownership may influence managers in other ways. We explore one such relation in our paper “Common Ownership and Voluntary Disclosure.” Common ownership may influence a firm’s decision to publicly disclose information for two reasons. First, to the extent that common ownership decreases competition, firms may be less concerned about revealing proprietary information to competitors, leading to increased disclosure. To measure common ownership, we calculate the extent to which institutional owners, who are required to report their holdings to the SEC on a quarterly basis, own shares in multiple firms in the same industry (e.g. Coke and Pepsi). We predict—and find—a positive relation between common ownership and the likelihood that a firm issues a management forecast, suggesting that common ownership is associated with increases in public disclosure, controlling for levels of institutional ownership and a range of firm and industry characteristics. In order to distinguish between the two possible reasons that common ownership might be related to increased disclosure, we conduct additional tests. 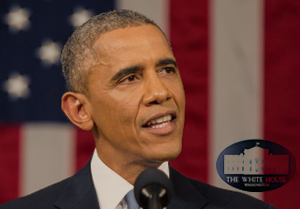 If firms seek to collude, they may prefer to communicate through alternative methods as opposed to public disclosure: examples include trade associations, executives with personal or professional connections, and common directors among firms in the same industry. To the extent that common ownership decreases competition, firms may be less concerned about revealing proprietary information to competitors, leading to increased disclosure. 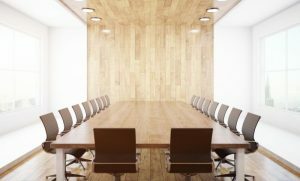 We find that common ownership increases public disclosure less in the presence of overlapping directors. This result provides support for the idea that the increased public disclosure observed is being used to facilitate collusion rather than just resulting from decreased proprietary costs as overlapping directors should not affect the costs of revealing proprietary information or the capital market benefits of disclosure. We also consider the effects of barriers to entry on the relation between common ownership and disclosure. If barriers to entry are low, common ownership may affect disclosure less because firms in such industries are more concerned about new entrants making the competition with existing market participants less important to disclosure decisions. We find results consistent with this prediction. In industries with high barriers to entry (as measured by high average levels of property, plant, and equipment), common ownership is more strongly associated with disclosure. A potential concern in interpreting the results of our study is selection bias: large investors may choose to invest in industries in which firms are more forthcoming with disclosure. To mitigate this concern, we take advantage of an exogenous shock (acquisition of Barclays Global Investors by Blackrock in 2009); this merger resulted in increases in common ownership only for firms who were owned by Barclays and had a competitor owned by Blackrock or vice versa. Our results in this analysis are consistent with those from our primary analysis, supporting the proposition that increases in common ownership cause managers to change their disclosure behavior. In short, the findings from our study support the prediction from the accounting literature that competitive dynamics affect firms’ disclosure decisions. Further, our results provide a potential mechanism by which the anti-competitive outcomes in the presence of common ownership documented in other studies may be achieved: coordination through public disclosure. 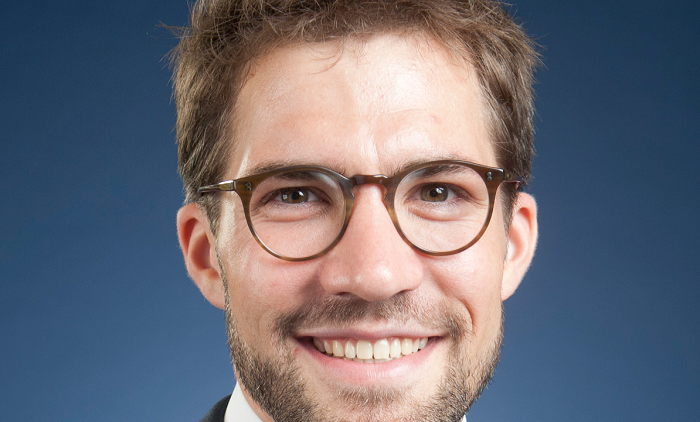 Finally, although prior theoretical and empirical work documents the potential harm to consumers from common ownership, our work suggests there may be benefits to shareholders in the form of increased disclosure. Andrea Pawliczek is an Assistant Professor of Accounting in the Turlaske College of Business at the University of Missouri. Nicole Skinner is a PhD Candidate in the Department of Accounting in the Leeds School of Business at the University of Colorado at Boulder.